Steel has been a leader in automobile applications since 1920s. Currently, steel is the primary material in body and chassis structures. It is the backbone of the entire vehicle. In cars, these days, steel makes up about 65 % weight. It plays many roles in present day vehicles. It protects occupants, provides positive driving experience, reacts to road loads, provides comforts, and provides attachment points to other components of the vehicle. As there is a high emphasis on greenhouse gas reductions and improving fuel efficiency in the transportation sector, the automobile industry is investing significantly in lightweight materials. The industry is moving towards the objective of increasing the use of lightweight materials. It is giving priority to the activities connected with the development of new materials, forming technologies, and manufacturing processes. The weight reduction is still the most cost-effective means to reduce fuel consumption and greenhouse gases. It has been estimated that for every 10 % of weight eliminated from a vehicle’s total weight, fuel economy improves by 7 %. This also means that for every kilogram of weight reduced in a vehicle, there is around 20 kg of carbon dioxide reduction. Over the last decade, a strong competition between steel and low density metals has been observed in the automobile industry due to the increasing requirements of passenger safety, vehicle performance and fuel economy. The materials used in automotive industry need to fulfill several criteria before being approved. Some of the criteria are the results of regulation and legislation with the environmental and safety concerns and some are the requirements of the automobile users. In many occasions, different factors are conflicting and therefore a successful automobile design is only be possible through an optimized and balanced solution. Around 65 % of every vehicle is made of steel, mostly in what is called the ‘body in white’, which is the skeletal structure of the automobile plus the closures. People differ on their definition of ‘body in white’, but that is how ‘World Auto Steel (WAS)’ defines it. Automobile manufacturers use steel because it is the strongest, most affordable material available today for the application and can be engineered in a lot of different ways to meet the needs of crash safety and the performance of the vehicle. There are a lot of opposing requirements for materials in the automotive industry. For instance, for front end crash requirements, the material has to be able to absorb crash energy so that it stalls that energy from getting into the passenger area and keeps the passengers safer. However, if the vehicle is involved in a side collision, the material has to be strong enough to deflect energy as the passengers do not want it to crumple. Steel has the kind of flexibility and qualities that mean it is able to meet these requirements, and able to meet them affordably. The response of steel industry to the new challenges is a rapid development of higher strength steels, named Advanced High Strength Steels (AHSS). These steels are meeting the challenge with less steel at a lighter weight. Further these steels are characterized by improved formability and crash worthiness compared to conventional steel grades. WAS has done a number of studies to compare AHSS with aluminum. First of all, AHSS can be manufactured at very thin gauges, but maintain the strength of a mild steel, which is different than the conventional steel that cars were primarily made of a couple of decades ago. This allows the automotive designers to replace conventional steels with AHSS in the same amount of packaging space. With AHSS, automobile manufacturers are using less material and saving a lot of mass. The studies done by WAS have demonstrated in a number of projects (latest is ‘Future Steel Vehicle-FSV) that the use of 97 % of the high strength steel (HSS) and AHSS has saved 39 % mass over the benchmark weight. Automotive steels can be classified in several different ways. One is a metallurgical designation providing some process information. Common designations include (i) low-strength steels (interstitial free and mild steels), (ii) conventional high strength steel (HSS) (carbon-manganese, bake hardening and high strength low alloy steels), and (iii) the new AHSS (dual phase, transformation-induced plasticity, twinning-induced plasticity, ferritic-bainitic, complex phase and martensitic steels). Additional higher strength steels for the automotive industry include hot formed steels, post forming heat treated steels, and steels designed for unique applications that include improved edge stretch and stretch bending. A second classification method important to part designers is strength of the steel. Therefore, the general terms HSS and AHSS are used to designate all higher strength steels. This classification system has a problem with the ongoing development of the many new grades for each type of steel. Therefore, a DP (dual phase) or TRIP (transformation induced plasticity) steel can have strength grades that encompass two or more strength ranges. A third classification method presents various mechanical properties or forming parameters of different steels, such as total elongation, work hardening exponent, or hole expansion ratio. These properties are important for press shop operations and virtual forming analyses. The most common classification of steels is by metallurgical designations. 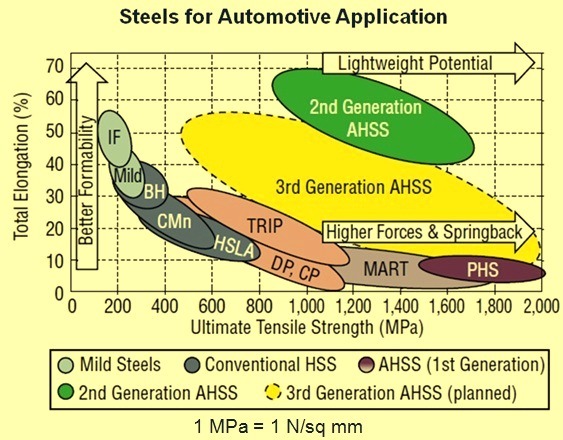 As seen in Fig 1, steels for automotive applications can be classified as mild steel, conventional HSS, and AHSS. AHSS has three generations. Increasing safety and fuel economy regulations have been pressuring the automotive industry to design safer yet lighter vehicles. HSS and AHSS have been replacing mild steels for the last decade in the automobile bodies. The typical, recently introduced vehicle contains about 30 % HSS and 30 % AHSS. Mild steels generally comprise of one microstructure namely ferrite. These steels have a maximum tensile strength of 280 N/sq mm and are very easy to form. Mild steels were once the dominating material in car bodies, but now their use is limited to stiffness-related components and cosmetic parts with complex bending and drawing. The two main material types in this group are (i) mild steels (also called low carbon or plain carbon steels), which have very little alloying element, and (ii) interstitial free (IF) steels, which have ultralow carbon and even lower strength, but higher formability. The main strengthening mechanism in conventional HSS is solid-solution hardening. In the bake hardening (BH) steels, the chemistry and processing are designed to take carbon out of solution during the paint baking cycle. In this way, the steel is made softer and more formable for the press shop, but it gains more strength after being put in service. Carbon manganese steels are mild steel solid solution, strengthened by adding manganese alloy. High strength low alloy (HSLA) steels are carbon manganese steels strengthened with the addition of a micro alloying element such as titanium, vanadium, or niobium etc. These steels though have a tensile strength up to 800 N/sq mm, they can still be press formed. HSLA is one of the first commonly used HSS in the automotive industry. They are in use since 1990s. These steels are still used in many cars. BH steels are being used in body closures, carbon manganese steels and HSLA are being used in energy absorbing areas. However, AHSS is now replacing HSLA in these applications, since it can absorb more energy. AHSS of first generation has more formability than HSLA at the same strength level. These steels typically have a martensitic microstructure, sometimes with one or more additional phases to improve formability. Martensite is the hardest and strongest form of steel, but it also is the least formable. To make strong steels formable, a mixture of formable and strong phases is needed. The most commonly used AHSS today is dual-phase (DP) steel, which contains ferritic and martensitic phases for a balance between formability and strength. DP steels typically have higher elongation than HSLA at similar strength levels. This unique microstructure is created by special heat treatments. Currently DP steels are available with tensile strengths ranging from 590 N/sq mm to 1,400 N/sq mm. DP steels are used in applications such as crash boxes, front end structures, A and B pillars, roof rails, and sill reinforcements. Complex-phase (CP) steels are of first generation AHSS. They usually have higher formability than DP steels and contain bainite in addition to martensite and ferrite. Grain refinement is created by micro alloying with titanium, vanadium, or niobium. These steels have strength levels ranging from 800 N/sq mm to 1,180 N/sq mm and are generally used in car bodies. Typical applications include sill reinforcements and A- and B-pillar reinforcements. Transformation-induced plasticity (TRIP) steels of first generation AHSS contain retained austenite in addition to ferrite and martensite. When these steels are deformed, the austenite transforms to martensite, which helps distribute the strain and increase elongation. These steels have higher formability than CP, DP, and HSLA steels. TRIP steels currently are available in tensile strengths ranging from 590 N/sq mm to 1,180 N/sq mm. TRIP steel is replacing DP and HSLA steels because of its higher energy absorption and its ability to be formed into complex components with deep draws. Typical applications include cross members and front and rear rails. Martensitic steels (MS) belong to first generation AHSS. They are, as the name suggests, mostly martensitic with some small amounts of ferrite and bainite. These steels have the highest strength but lowest elongation (or formability) levels. Martensitic steels, presently available are with strengths ranging from of 900 N/sq mm to 1,700 N/sq mm. These steels are used in automobile body parts in which deformation is limited. Martensitic steels are very hard to press form, so they typically are roll formed or press hardened (hot stamped). In press hardening, the manganese boron alloyed steels are heated, formed, and then quenched to get their final strength. Springback is eliminated, and very strong components can be formed to complex geometries. Typical press-hardened steels (PHS) (or hot stamped) have tensile strength of 1,500 N/sq mm to 1,800 N/sq mm. These days PHS are being used extensively in safety and crash-resistant car body components. New generation PHS are expected to have strength of 2000 N/sq mm. Both of these PHS grades are used where only very small deformation is allowed. These steels have been adopted for use in many parts, including sill structure, as well as A- and B-pillar reinforcements, in recent cars. Recently many floor panels also are being hot stamped to save weight. One of the major issues facing the users of first generation AHSS is edge cracking during flanging at room temperature or under crash conditions. Thus, the condition of blanked and sheared edges of blanks, including the amount of strain hardening and burr formation at the blanked edge, is extremely critical for subsequent deformation of the part in stamping and during a crash. Typical AHSS have limited formability which decreases even further as strength increases. Hence, over strength level which is ranging from 1,000 n/sq mm to 1,200 N/sq mm, cold forming of AHSS is limited to very simple geometries. The total elongation in case of hot stamped components, on the other hand, is limited to 5 % to 7 % after quenching and hence they do not absorb as much energy under crash conditions as other AHSS do. Steels with higher tensile elongation have better cold formability for stamping and more energy absorbing capacity for automotive applications. First generation of AHSS normally gets their formability from ferrite microstructure and their strength from martensite microstructures. The second generation of AHSS makes use of induced plasticity effects. The formability of second generation AHSS is significantly higher than first generation AHSS at a tensile strength of 980 N/sq mm. The difference in second generation AHSS is its austenitic microstructure which is the key to the transformation induced plasticity (TRIP) effect. When austenite is deformed, it transforms into martensite and thus gets stronger. This delays local necking and fracture in the forming of the sheet metal. Regular TRIP steels, which are first generation AHSS such as TRIP of strength 980 N/sq mm, have retained austenite that is only 10 % to 15 % of volume, but their formability is significantly better than that of other first generation steels (Fig 2). Austenite is not stable in most steels at room temperature. However, high alloy elements such as in austenitic stainless steels allow for up to 100 % austenite, so these materials are more formable than the TRIP steels. Austenitic stainless steels are classified as second generation AHSS, as they exhibit both high strength and elongation. Another strengthening mechanism is twinning induced plasticity (TWIP). TWIP steels also are 100 % austenite at room temperature. However, in these steels, high alloy elements (manganese content more than 15 %) cause formation of twins when the steel is deformed. The twin boundaries act like grain boundaries to strengthen the steel. These steels usually have greater than 50 % elongation at a strength level of around 1,000 N/sq mm. In addition to TWIP and austenitic stainless steels, new triplex steels are being developed. They have very high manganese content (15 % to 30 %), in addition to other elements. Current applications of second generation AHSS in the automotive industry is still limited though they have very high formability and strength. This can be attributed to two main factors namely (i) high alloying elements increase the cost of steel, and (ii) the steels have a tendency for delayed cracking fracture after the automobile part is formed and stored. Presently many high end vehicles have austenitic stainless steel components in their chassis and bodies. The additional cost of this steel is being justified by light weight and the ability to fit the component in a limited space. Several studies have shown that it is possible to cold form complex components (such as B-pillars) with stainless steel. It is also possible to hot form and quench the steels to gain even more strength. Steelmakers are preparing guidelines that can solve the issues of welding and delayed cracking in TWIP steels. One solution for delayed cracking, for example, is to add more alloying elements such as aluminum. Several steel plants currently produce TWIP grade steel with 980 N/sq mm strength. Even higher strengths are also may be possible. TWIP steel has found only one major automotive application at this point. In one of the car model the front bumper assembly has been replaced with a one piece TWIP steel bumper beam. Although the second generation of AHSS steels has not been used extensively in the automotive industry, yet a large number of people from the automotive industry believe that TWIP steels can be applied in mass production in select applications with further improvements. AHSS of first generation has very limited formability. AHSS of second generation though has high strength but are expensive because of their high cost alloying elements. Hence there is a requirement of a new generation of steel at reasonable cost which has high strength and high formability. Several third generation steels have been developed recently but only two types of these steels are under production currently. These are ‘quenching and partitioning steel (Q&P steel) and TRIP aided bainitic ferrite steel (TBF steel). The Q&P steel grade has carbon, manganese, silicon, nickel, and molybdenum alloying elements. Depending on the strength level, alloying elements can be as high as 4 %, which is much lower than the second generation of AHSS. During heat treatment of Q&P steel, quenching is interrupted, and the steel is reheated for partitioning. This creates 5 % to 12 % stable retained austenite, 20 % to 40 % ferrite, and 50 % to 80 % martensite. Q&P steels were initially commercialized with 980 N/sq mm strength and later with 1180 N/sq mm strength. It has been demonstrated that a B- pillar reinforcement can be cold formed using Q&P steel with 1180 N/sq mm strength. Q&P steel of strength 980 MPa is more formable and less prone to edge cracking than DP steel of same strength. Several automobile manufacturers have adopted Q&P steels for A- and B- pillar reinforcements. TBF steel is also a low alloy grade which can be produced by existing heat treatment facilities. Its key component is stable retained austenite. TBF steels of strength ranging from 980 N/sq mm to 1470 N/sq mm have been developed. 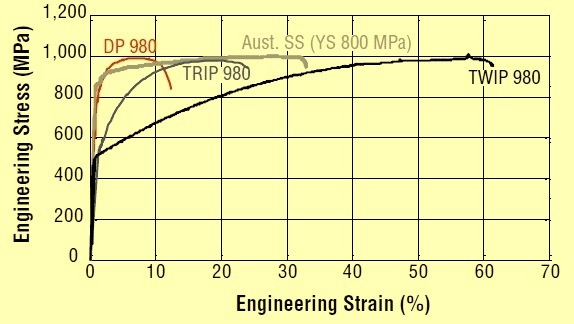 Cold forming techniques to overcome springback and excessive necking as well as spot weld nuggets have been developed for TBF steel having strength 1180 N/sq mm. TBF steel of strength 1180 N/sq mm is being used in A- and B- pillars as well as on rocker reinforcements in some car models. In some models TBF steels constitutes presently 4 % of the body in white. Some car manufacturers are planning to increase the use of cold formed, ultra high strength steels up to 25 % in near future. Another type of third generation AHSS which is still under development is Nano steel. This steel is not yet commercialized. This steel has a nano crystalline structure created by special chemistry and heat treatment. After casting, the steel is mainly austenite with some borides. After heat treatment, austenite is refined to nanometer scale. During the plastic deformation, stress induced nanoscale phase formation increases strain hardening. The terminology used to classify automotive steel products varies considerably throughout the world. Hence, it is important to note that different specification criteria have been adopted by different automotive companies throughout the world and that steel companies have different production capabilities and commercial availability. Therefore, it is imperative to communicate directly with individual steel companies to determine specific grade availability and the specific associated parameters and properties, such as given below.